With the London Marathon fast approaching on Sunday, Prince William, Duchess Kate and Prince Harry sat down for a candid conversation at Kensington Palace on Friday to reflect on their work with Heads Together thus far. They began the campaign one year ago in order to "end stigma around mental health," and while they have since made strides, they know there's still work left to do. During their outdoor chat, the group revealed that Heads Together was actually Kate's idea. As she puts it, "Because it's a common thread, wasn't it? Mental health seemed to run between all the different areas we were working in." 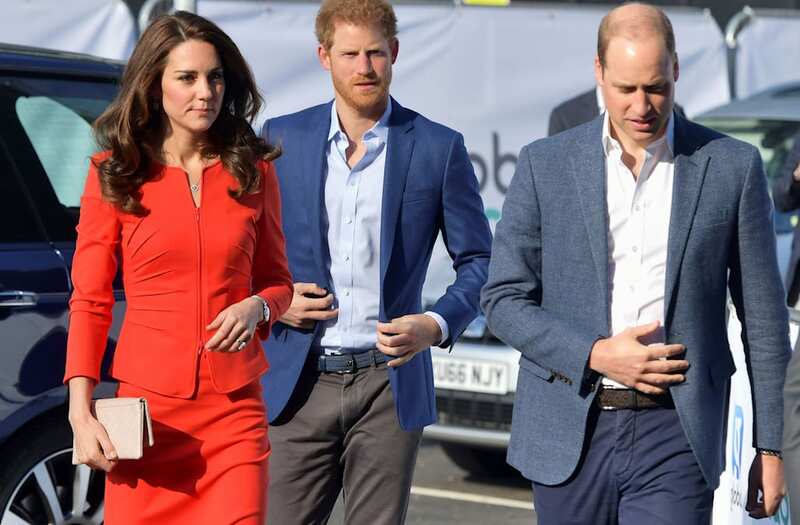 The three touched on everything from William and Kate adjusting to life as first-time parents to how William and Harry coped with their mother, Princess Diana's, death. "Remember the first few days with little George? You know you have no idea what you're really doing. No matter how many books your read, nothing can prepare you for it," the duchess reflected. She even reminded William of how quickly they jumped back into their everyday routine only to realize how much of a "steep learning curve" parenting would actually be. The Duke and Duchess of Cambridge and Prince Harry leaving the Institute of Contemporary Art in London where they outlined the next phase of their mental health Heads Together campaign. The Duke and Duchess of Cambridge and Prince Harry at the Patron's Lunch in The Mall, central London in honour of the Queen's 90th birthday, in an open topped Range Rover. Prince Harry, the Duke and Duchess of Cambridge leave St Paul's Cathedral in London following a national service of thanksgiving to celebrate the 90th birthday of Queen Elizabeth II. The Duke of Cambridge (left), The Duchess of Cambridge (centre) and Prince Harry (right) attend the World Premiere of Spectre, held at the Royal Albert Hall in London. The Duke and Duchess of Cambridge and Prince Harry arriving for the annual Commonwealth Day service at Westminster Abbey, London, on Commonwealth Day. Catherine, Duchess of Cambridge, Prince William, Duke of Cambridge and Prince Harry visit The Tower Of London's Ceramic Poppy installation 'Blood Swept Lands and Seas of Red' by artist Paul Cummins, commemorating the 100th anniversary of the outbreak of First World War. The Duke and Duchess of Cambridge and Prince Harry watch riders at the finish line of Stage 1 of the Tour de France in Harrogate. Prince Harry, the Duchess of Cambridge and the Duke of Cambridge watch a fly-past by the RAF on the balcony at Buckingham Palace following the Trooping the Colour parade, London. Prince Harry, the Duchess and Duke of Cambridge with their wands on the set used to depict Diagon Alley in the Harry Potter Films during their visit to Warner Bros studios in Leavesden, Herts where the popular movies were produced. The Duke and Duchess of Cambridge watch with Prince Harry during the Team Eventing Jumping Final on day four of the London Olympic Games at Greenwich Park, London. The Duke and Duchess of Cambridge and Prince Harry chat with children during a visit to Bacon's College in Greenwich, London, where they attended the launch of a new sports project that aims to train the next generation of sports coaches. Prince William (left), Catherine, Duchess of Cambridge and Prince Harry stand on the balcony at Buckingham Palace during the Diamond Jubilee celebrations in central London. The Duke and Duchess of Cambridge talks to Prince Harry before a reception in the Waterloo Chamber, before her Sovereign Monarchs Jubilee lunch at Windsor Castle. Prince William and his bride Kate leave Westminster Abbey, London, after their wedding, followed by Prince Harry (rear, left) and Pippa Middleton (rear, right). "Both of us have always been open to each other, saying we've never really talked about it. We've never really talked about losing a mum at such a young age." Kate sweetly went on to praise them both for their strength and resilience in the face of the trauma they endured.